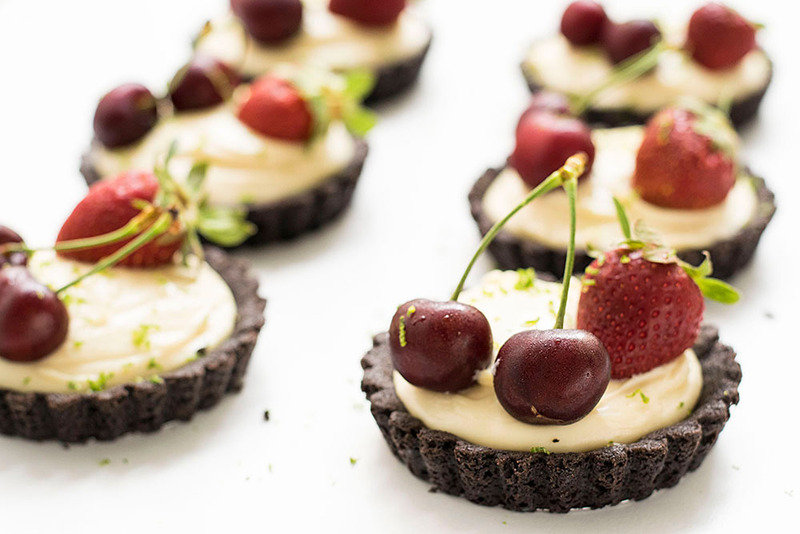 These no-bake oreo tarts are made with white chocolate namelaka and red fruits. Namelaka is the japanese term for extra creamy texture! Namela-what? The first time I heard of the name namelaka I was confused. Apparently there was a kind of chocolate cream out there that I didn’t know of. Strange! It also took me a few tries to remember it correctly and not say something like lemonaka… But does the name matter when these no bake oreo tarts with white chocolate namelaka and red fruits are so delicious and luscious? Namelaka means creamy texture in Japanese and it’s actually a cream a lot like chocolate ganache, only a little creamier! This is due to the fact that the total amount of cream plus milk is more than the amount of chocolate. To compensate for the greater amount of liquids, some gelatin is added. Contrary to its difficult name, it’s fairly easy to make. You’ll only have to be a little careful with the ingredients measurements, just to achieve the right consistency. For the tart shells I wanted something easy and with not so many calories as the typical oreo crust. So I thought using the filling of the cookies as a substitute for half of the butter that the basic recipe requires. Heating the crushed cookies in the microwave oven helps the filling – which is basically sugar and fat – to melt. (If you don’t have a microwave oven, I recommend separating the cookies from the filling first, then crashing the cookies and melting the filling and butter in a small saucepan). 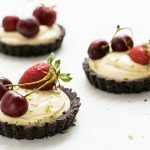 The first time I made these no-bake oreo tarts, was at my mother’s birthday. She’d come to visit me from Crete, and the least I could do was something sweet and pretty to help us celebrate. Like me, she too has a sweet tooth. Only, contrary to me, that I breathe for chocolate (hello chocolate trilogy dessert…! ), she prefers desserts with vanilla and fresh fruits. So, I thought these tarts would be a good choice. Fortunately, so did my mom! I found great pleasure in watching her taking the first bite, waiting for a moment for the flavors to reach her taste buds and then seeing her smile with happiness! Yes, in my family we believe that a good bite can make you feel happy! Don’t believe me? Picture this: A nice, crumbly chocolate cookie as a base. Α creamy filling with a hint of vanilla and lime. Some fresh, fragrant, sweet and sour fruits on top. And maybe some sprinkles of lime zest, just to get a bit fancy. YUM! I don’t know many people who could resist to something like that. 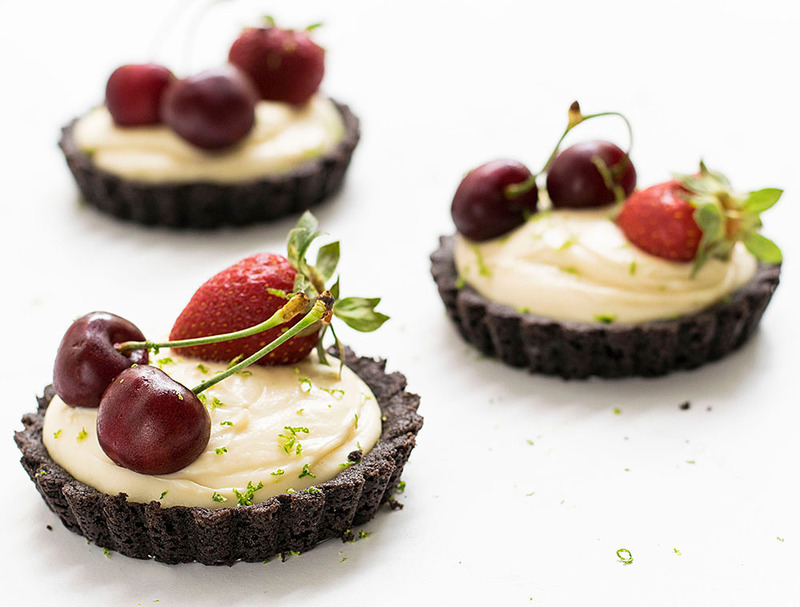 Of course, these no-bake oreo tarts with white chocolate cream are best during spring/summer, when strawberries and cherries are in season. But why limit yourself? You can top them with any kind of fruit you fancy. Peaches, grapes, tangerines, caramelized apples, kiwi are some of the choices I can think of. Each will result in a different taste, equally delicious! 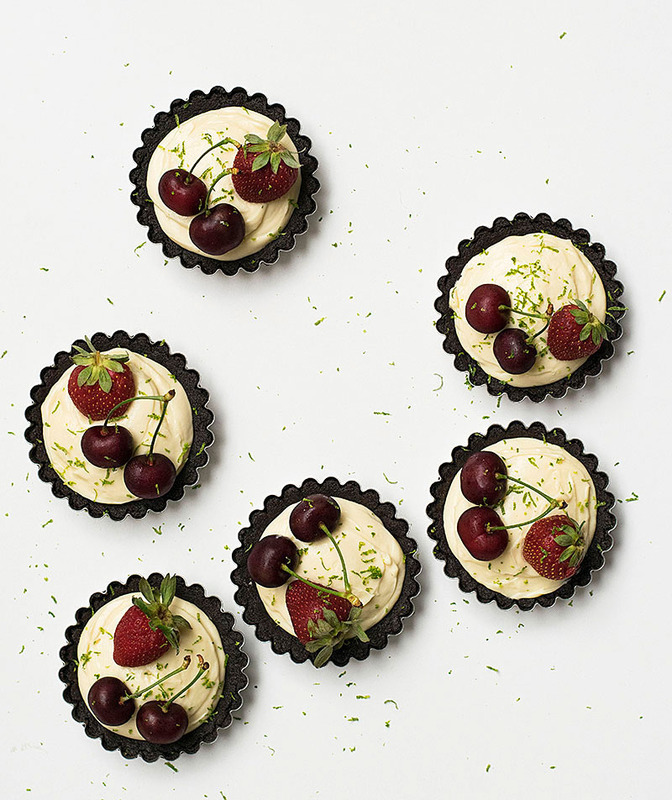 This recipe will yield 6 (4inch/10cm in diameter) mini tarts. Tart pans with removable bottoms are recommended. You can make this recipe in one big tart pan, but you may have to increase the amount of the ingredients by half, depending by the size of your tart pan. You can also (and should) use the two recipes – tart shells and cream – separately. You can fill the shells with a simple chocolate ganache (dark or white) or dulce de leche and top with your favorite topping. And for the Namelaka cream, I’m thinking using it as a filling for éclairs, choux, doughnuts, trifles…sky is the limit! Just keep in mind that the cream needs to be stored in the fridge, and it will keep for 3-4 days. And in case you have some red fruits left over and don’t know what to do with them, why don’t you make this smoothie? It’s guaranteed you’ll love it! Heat the cream, sugar, salt, vanilla and zest just before boiling point and add it to the chocolate. Let it sit for one minute and stir gently to melt the chocolate. Squeeze the gelatin in your hand, add to the chocolate and stir. Add the milk, stir to combine and refridgerate for 4-6 hours or overnight. Crush the cookies into fine crumbs (by hands or in a food processor). Put them in a heatproof bowl with butter and heat on microwave oven on high in 30 seconds increments until very warm and the butter melted. Stir well. Fill 6 (4-inch) tart pans with removable bottoms. Press cookie crumbs very firmly, until really compact. Refridgerate. 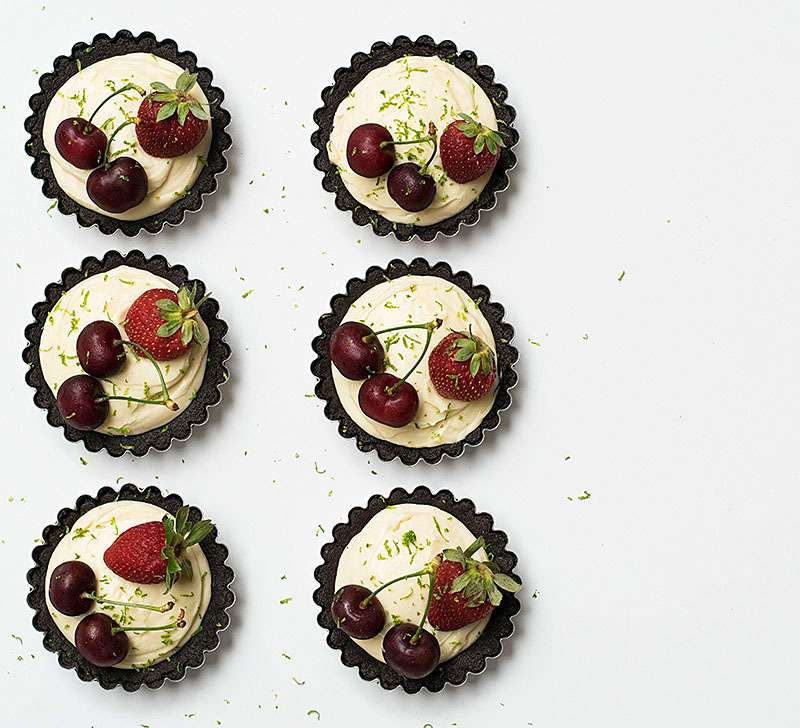 Just before serving, fill the tarts with the cream (best to use a pastry bag, otherwise a spoon), top with the fruit and some lime zest. Unmold and serve. If you have leftovers, they keep well in the fridge, in an airtight container, for up to 3-4 days. Previous Post: « Fluffy rice in a pot, every time!